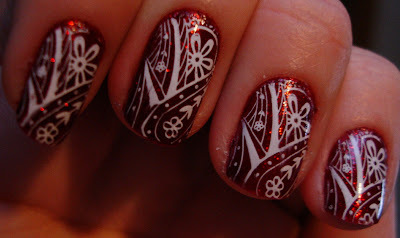 Tonight I have for you a really fun little mani using China Glaze and Konad. 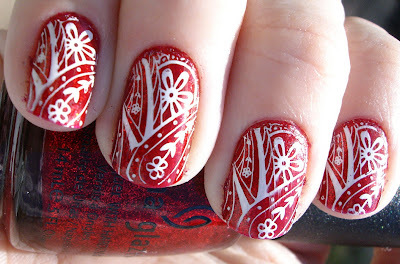 For these nails, I used three coats of China Glaze Ruby Pumps, and I have to say, I am absolutely loving this red. I don't do red too terribly often, so when I do I like it to be fabulous, and as such only have a few really red reds (not burgundy/etc). 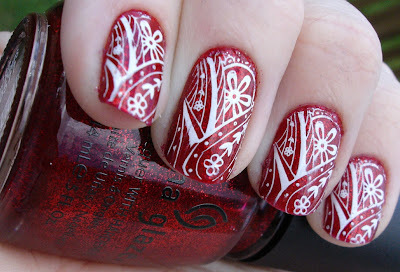 This polish may have inspired me to do reds more often; it is just that fabulous. The sparkly red glitter is delicious and will leave you staring at your nails. I imagine I can't say anything that hasn't been said about this color, so I will not go on anymore. All I can say is - if you don't have this one, you really should go buy it. The one downside to this is that it is hard to catch the glittery awesomeness of this polish on camera, but I tried to pick out a few shots where you can see the glittery bling. Although I was tempted to leave this one alone with just the base color, I decided to use this pattern that I have been dying to use since I bought this plate. 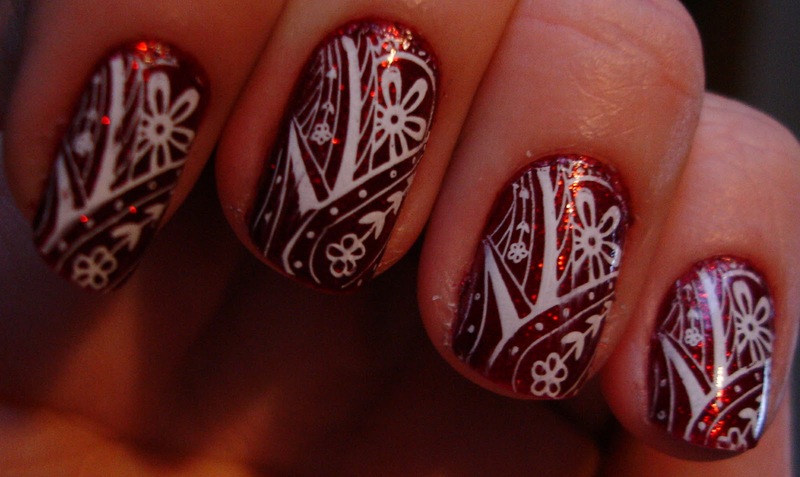 I used Konad m60 with Konad Special White polish for the design. You can see my impatience in a few streaks from when I added a coat of Seche Vite - I really need to learn to wait just a bit longer before top coating my Konad designs! This is a really fun mani, even if it does seem a bit more summery. I have promised myself to try to do something a bit more fall next - we will see how that goes over. But it is just a few days until October so I will have to start using some of my Halloween design ideas! Remember to enter my follower appreciation giveaway if you have not yet... only a few more days to enter! Awesome! I'm so excited I just got my first konad kit, already deciding what my next plates will be !! 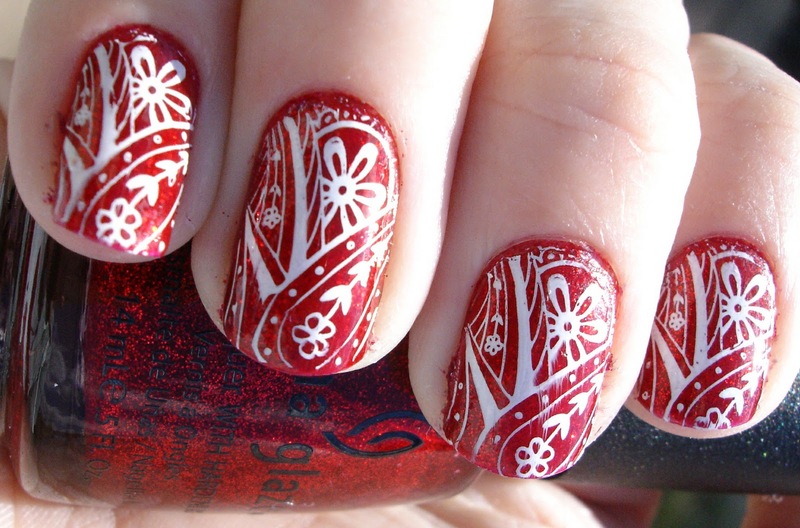 I love that Konad design, its one of my favourites. you did right adding konad :) this is a great combo! Serena - Yay, thanks so much for being #100! This is one of my favorites as well, I had been saving it for something special. Alice - Thanks! I agree, I am loving the combo. OPI DS Magic - Magical It Is!